In the rush to explain the root cause of the appalling and tragic events at Grenfell Tower in London, a vital truth is lost in the shorthand of media headlining common across every media channel from the BBC to the “red tops” – Aluminium itself was never the problem. Whilst the ongoing enquiry ought not to be prejudged, the truth, lost to the public, is that ACP’s (Aluminium Composite Panels) of a lower than advisable fire rating have (at the time of writing) been highlighted as the villain of the piece. And when compared with non-composite solid aluminium cladding panels, it’s easy to see why. Solid aluminium cladding typically comprises a seamless 3mm aluminium sheet, cut to size and formed with rolled edges to provide mechanical strength as well as suspension lugs to facilitate on-site fixing. The final panel is purely aluminium which might be anodised or powder coated. It bears little comparison to an Aluminium Composite Panel, typically 4mm or 5mm thick overall, where relatively thin layers of aluminium are bonded to a thermoplastic core. The aluminium forming the sandwiched outer skins is normally less than 1mm in total thickness when both front and back layers are combined. So can we conclude that an ACP system, where only 20% of the construction is aluminium fairly puts aluminium in the firing line? Not according to Fusion Facades’ Managing Director, Mike Mckee. So where now for the dozens of local authorities and multiple occupancy high rise landlords across the UK, currently stripping existing buildings of offending ACPs? 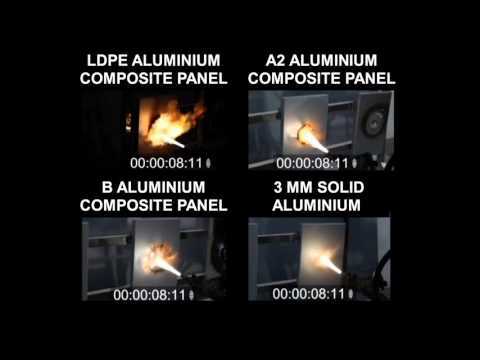 Analysis of the fire performance of the overall build-up of the installed cladding system, including fire breaks and insulation, needs to be carried out and a thorough examination of the fire safety specification at the time of construction will of course be essential to establish if safety has been compromised somewhere along the line. Then an honest review of material performance versus cost must be applied. The debate will no doubt touch on employing zinc as an alternative and safer cladding medium. But will this hold up against solid aluminium panels given that the melting point of zinc is some 230 degrees Celsius less than aluminium’s 650 degrees Celsius combined with the need to mechanically support zinc sheeting with bonded-on materials such as plywood. And as with Aluminium Composite Panels, there will always remain that fear of potential delamination somewhere in the future years of a building’s lifespan. The extended use of Glass Reinforced Concrete panels (GRC) to the highest levels of multi-storey buildings carries a further toll in terms of the required strengthening of the structure to support the considerable extra weight – surely a step backwards when compared to the inherent lightness of a modern aluminium alloy. Given the total cost of high rise construction, refurbishment and renovation, comparatively small savings achieved through a reduction in specification should not be at the expense of increased risk to human life. As the facts emerge, it is to be hoped that the public can be reassured that councils, health authorities and education authorities specifying solid aluminium in the construction of their homes, public buildings and places of work does not pose a safety risk and ought not to give rise to alarm or concern.